We are working on a new a-arm bushing that can replace the OE bushings that tend to wander. 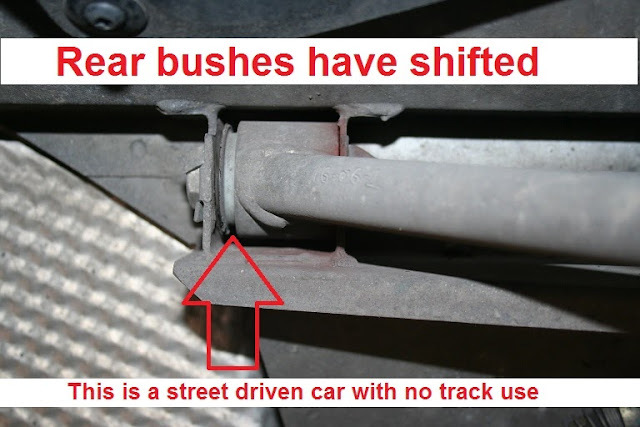 The plastic sheath of an OE bush tends to crush under repeated cycling and allows the bushing to move - which results in the a-arms eventually making contact with the chassis. Our new bushes feature a metal sleeve with a lip that when properly positioned, should eliminate the wandering we see with the stock bushes. We've also made ours with rubber that is ~5% stiffer than stock. They press in easily with some grease and a vice. We've tested fit them successfully. I've kicked off production and expect parts in a few weeks. Expect the prices to be competitive with current offerings. Ours will be zinc-plated as well - unlike the prototypes shown below. We are offering them in semi or complete kits. This way, if you only have to do one or two arms, you can get just what you need. Naturally, we would recommend replacing them all at once. I will probably have a few on hand for you to check out at WCLM next week.